Harith's Space! : Dirving in Dubai! 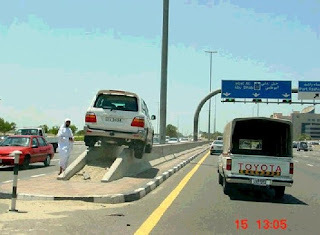 lo0o0oo0ol, that's really funny, but it is not only when drivin in Dubai, that's true in all Arabic countries, Isn't it? Well now you guys can fell what I'm suffering over here.. I had many close encounters with death on the roads of Dubai. But that is nothing compared to what is happening elsewhere in Dubai.